Private View: Sunday 1st October 2017, 11am – 4pm. The Exhibition continues until Saturday 28th October, 5pm. Foreward by Thomas Podd, Sotheby’s. 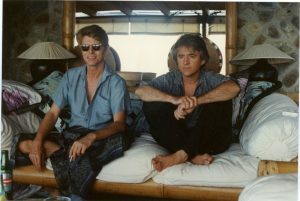 George has a unique and visionary artistic language, both as a musician and an artist. He became known for designing album covers for various bands in the 1970s and his collaboration with his long-term friend, the late David Bowie. His dreamlike works are populated by characters seemingly plucked from the walls of the Uffizi or the National Gallery. One can see the influence of the Flemish masters of the 16th Century; the visionary artists of post-War Vienna; the Dada and Surrealist schools. However, despite these tangible and conscious reflections, George’s work is entirely individual and his painting both delights and intrigues. He is an artist with a mythical fantasy song, one which is beautifully translated by brush on to canvas. It has been a pleasure to come to know George well, and to see a continued and strengthened enthusiasm for his work. He is the easiest of companions, quick to laugh, and as is immediately apparent to anyone who has seen his painting, the best storyteller. ‘Genius is one per cent inspiration, ninety-nine per cent perspiration,’ said Thomas Edison. For an inventor this may be true, though not for an artist; an artist also needs a visual education. George Underwood studied at Ravensbourne College of Art in the 1960’s, but that’s not where he acquired his singular vision. The grotesque faces that won him his first commission fresh out of college – dismissed by his tutor as ‘those weird drawings’ – owed their conception to a superior teacher: Leonardo da Vinci. Leonardo’s fantastical Profile of a Warrior in a Helmet in the British Museum made such an impression on the young Underwood that 50 years on he is still drawing warriors and still learning from the masters; he’ll pop into the National Gallery for 10 minutes and stay for two hours. But as the stack of books on his studio shelf suggests, his tastes range more broadly. Alongside volumes on Rembrandt and Bosch there are books on Ernst, Dali, Surrealism and Futurism: this is, after all, the artist who in 2003 painted a tattooed Minotaur in a pose from a portrait by Titian. In literary fiction a fantasy world requires a structure, and the same is true of painting. Underwood’s visual fantasies would not hold us in thrall unless they were built on firm foundations. His long immersion in the work of the masters has given him a thorough grasp of draughtsmanship; if there is such a thing as high fantasy art, then Underwood’s is it. No matter how bizarre or outlandish his subject, there’s a formal satisfaction in the way the shapes fit within the space. It’s this sense of form that gives authority to compositions as peculiar as the group of four androgynous warriors who stare out at us from huge white coifs, like heads in clouds. ‘There’s a geometry going on, but it’s unconscious,’ Underwood says. It was his innate gift for drawing that persuaded his childhood friend David Bowie to give up art for music, realising after sitting next to him in art class that, as he later put it, he would ‘never achieve… his sense of rightness in relation to his subject’. Bowie knew when he was beaten. At the time Underwood’s chosen medium was pencil, but he took up painting in oils in the 1970’s and has been refining his technique ever since. The textures of his embroidered costumes reveal lessons learned from Velázquez’s brushwork and Ernst’s ‘frottage’, while the subtle modulations of colour in his earth-based palette rely on glazing techniques borrowed from the Dutch masters. As a technician, he’s in a class of his own. Not many artists today could paint the fur on a hybrid leopard-cat – ‘A rare breed, I think you’d call it,’ he jokes – so convincingly you could stroke it, or the sunlit daffodil in its rider’s hand so persuasively that it appears to protrude from the picture plane. ‘I had good reference for that,’ he confides, ‘loads of lovely daffodils outside to choose from.’ But that pristine still life is an exception. ‘I purposely don’t paint from life,’ he tells me; ‘I want to trust my imagination.’ He’s pleased to report that, although he’s getting older, his imagination ‘still seems to be working’. 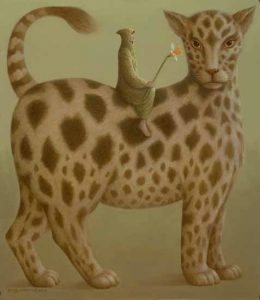 For proof, you need look no further than the leopard-cat and its daffodil-holding rider. ‘In the scale of things, is it a big cat or a little person?’ he wonders. I point out that the daffodil is out of scale with both. ‘I’m really messing with your mind here,’ he says.